NEW YORK—Renowned musicologist and music professor Dr. Arbie Orenstein is familiar with great performances. He has taught at Queens College for almost 50 years and has worked with famous choreographers. When he experienced Shen Yun Performing Arts, he was captivated by the performers’ artistry from their elegant dance movements to the notes that graced the entire theater. Orenstein saw Shen Yun at The David H. Koch Theater at Lincoln Center on March 17. The music professor has a Ph.D. in musicology and is an expert on the life and works of French composer Maurice Ravel, where he has authored a number of books about him. As a pianist, Orenstein has recorded the world premieres of several works by Ravel and accompanied many outstanding cantors and concert artists, according to the New York Philharmonic website. 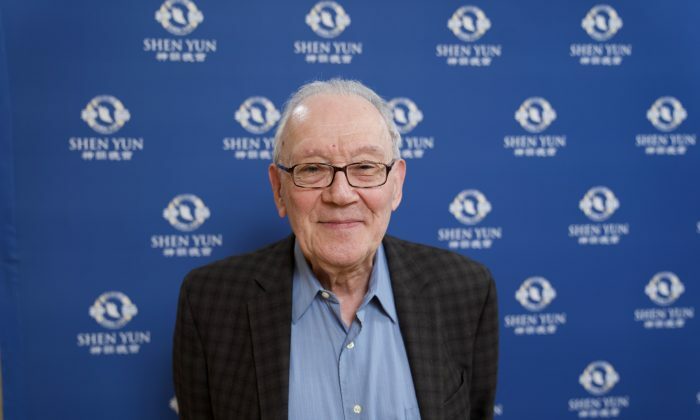 Orenstein said he found Shen Yun’s blend of Eastern and Western musical instruments unique. “It [has] many of the harmonies from the West and the subtle sounds of the East from the instruments—[which] are really quite unique. It’s a beautiful performance,” he said, adding that the overall artistic level of the performance was extraordinary. The distinct yet harmonious sound is achieved through using a Western orchestra as the foundation while using traditional Chinese instruments that lead the melodies, according to the Shen Yun website. The Chinese instruments include the erhu, dizi, pipa, and suona. This ensemble is able to express both the grandeur of a Western orchestra as well as the unique sensibilities of China’s 5,000-year-old civilization. “Bringing out the quintessence of each of these two great musical traditions, while at the same time presenting a unified theme is one of the distinct features of Shen Yun’s compositions,” Shen Yun’s composer Junyi Tan said in a previous interview. Shen Yun is in the midst of its 2019 tour, and has just completed its New York run at Lincoln Center, where it performed to 29 full houses over January and March. Based in New York, Shen Yun’s mission is to revive traditional Chinese culture after it was nearly destroyed by seven decades of communist rule, according to the company’s website. The production displays the inner spiritual core of China’s culture, which encompasses the virtues of benevolence, kindness, and honor. The dances draw upon the vast history of China’s 5,000-year-old civilization.